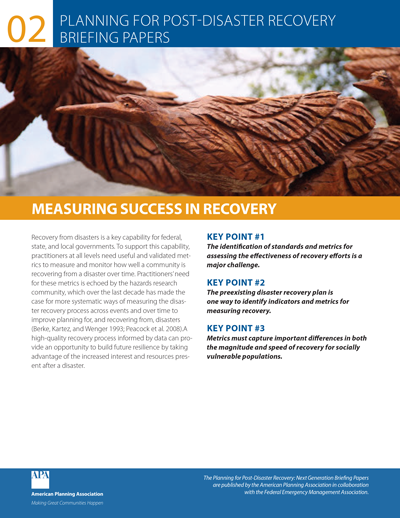 Recovery from disasters is a key capability for federal, state, and local governments. To support this capability, practitioners at all levels need useful and validated metrics to measure and monitor how well a community is recovering from a disaster over time. This briefing paper outlines practitioners' need for these metrics. The hazards research community over the last decade has made the case for more systematic ways of measuring the disaster recovery process across events and over time to improve planning for and recovery from disasters. A high-quality recovery process informed by data can provide an opportunity to build future resilience by taking advantage of the increased interest and present resources.